The opening of DR Koncerthuset means a national and international concert venue for Denmark and a new architectural landmark for the capital. 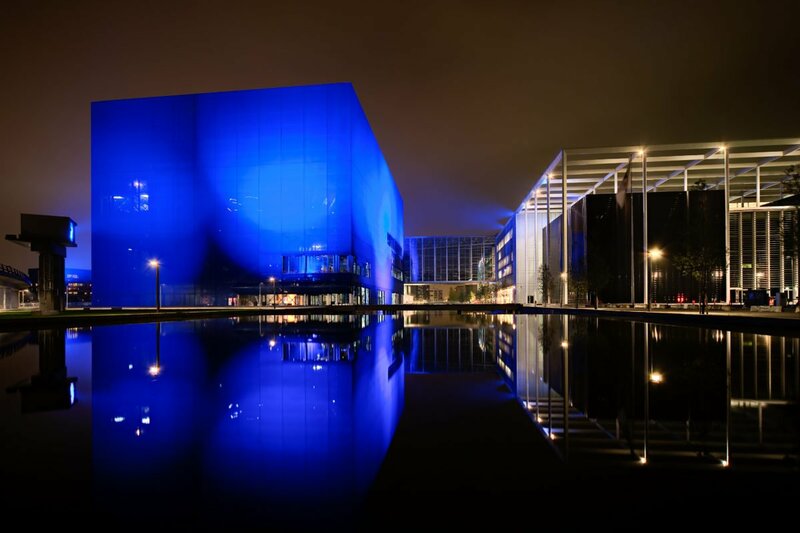 Jean Nouvel’s unique building puts Copenhagen on a level with other cities around the world which provide the best modern acoustic and visual setting for concertgoers. Events at DR Koncerthuset will range widely in terms of size and genre: small-scale jazz concerts in the foyer, chamber music, choral, rock and pop concerts in the three smaller concert halls and symphony concerts, guest appearances and large scale rhythmic concerts in the large concert hall. It will thus be possible to see, hear and experience DR’s own orchestras and choirs: Danish National Symphony Orchestra, Danish National Chamber Orchestra, Danish National Vocal Ensemble, Danish National Concert Choir, Danish National Girls Choir, Danish National Childrens Choir, Danish National Sprouts Choir and DR Big Band. Together with guest performances and guest soloists from Denmark and abroad, we will strive to attain new musical heights. The same applies to rhythmical music, where DJs and bands will form new groundbreaking concepts. Plug into Denmark’s biggest music and media organisation. DR now offers rentals of DR Koncerthuset unique facilities for a range of different possibilities. Whether you want organize a concert in one of our specifically designed studios or in our world renowned Koncertsalen – or you want some fantastic surroundings for your event/conference we can provide a full service. Koncertsalen is the biggest of DR Koncerthuset four studios. The stage is in the middle of the hall, while the 1800 seats go all the way round on multi-level terracing. The amphitheatre structure is inspired by the Berlin Philharmonia, while the warm, golden colours of the hall have been carried over from the old DR Concert Hall. Behind the stage towers the organ, and the atmospheric indirect lighting by way of reflectors on the walls completes the elegant idiom of the hall. Studio 1, with room for 1,800 guests (standing), includes 26 video projectors for animations and graphics and a lots of different installation options in relation to conferences, gala dinners and award shows. Studio 2 is inspired by the big production studios in Hollywood, and on the walls hang large panels with portraits of 38 selected soloists, conductors and composers printed on them as decoration. Surrounded by musicians like Miles Davis, Carl Nielsen and Kim Larsen, a setting has been created for great events. Studio 3 can be customized for any event, since there is no fixed stage or audience seating. The black walls in alternating polished and matte panelling have a wealth of hatches that can be opened and closed for sound-regulating effects. It is clear that the black-and-white design of the hall is inspired by a grand piano. 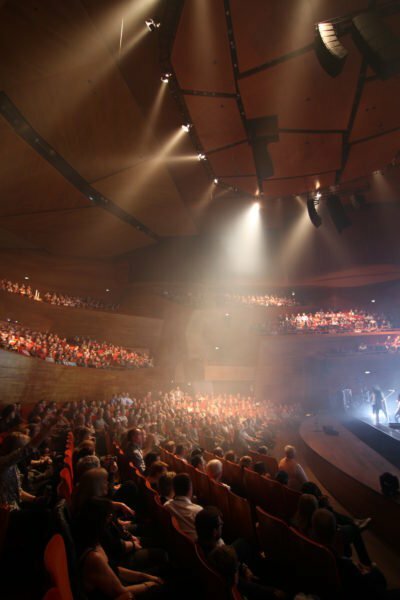 Studio 4 is also flexible as a concert hall, where the stage is built up of platforms and the audience sit on seats arranged for the event. The walls and ceiling are in deep red shades, and the soundregulating wall panels are designed like oblong, triangular ‘boxes’. This means that the hall can be adapted to a wide variety of events. Welcome to an exciting tour to DR Koncerthuset & DR Byen. To a world of architecture, design, music, tv-production and passion.